One of the many e-mails that hit the editorial inbox last week was from someone who’d had a trial to our weekly market update service (Africa& Middle East Telecom-Week), saying he could get all the African mobile subscriber data he needed “off the Internet for free”. 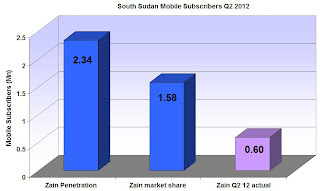 Zain – sadly much reduced from the glory days when in had its African operations – still has a first rate Investor Relations team who provide pretty accurate, well-presented and comprehensive data about the markets that they operate in, and the pack for the second quarter 2012 is no exception. But it also proves a point. South Sudan is currently of interest as a ‘new’ market that has not previously been tracked as an independent entity, so teasing out historical data from what was previously a merged entity is a little more difficult. And there’s an anomaly on the South Sudan page in the Q2 2012 data pack. Zain provides a mobile penetration figure for South Sudan of 22%, based on a population figure of 10.63 million. This gives a mobile subscriber base of some 2.34 million. Two snags. Firstly, this figure is unchanged from the figure shown in the Q1 2012 pack; and secondly Zain provides a figure for its market share of 38%. As it quotes its subscriber base in Q2 as 600,000, one might conclude that there are some 1.58 million subscribers in the country. So which figure is more right? We suspect that 1.58 million is probably closer to the mark, so giving a mobile penetration rate (using Zain’s population figure) of 14.8%, rather than 22%. So this shows is that even people who are normally very reliable can present conflicting data in a single page. This is what we try and make sense of in the weekly issues of ‘Africa & Middle East Telecom-Week’ – to learn more about the mobile subscriber market in South Sudan take a risk-free, no-obligation trial now. Do tweets foster MNO growth in Africa? Is CAPCOM big enough to make it in Nigeria?